Mrs. Lowell died today. She was ninety-one. We remember her fondly. There was a time when she taught us lady-like things, spidery handwriting and the proper way to serve tea. She belonged to another world. In her little cottage, there were relics of that bygone place and time. A fan open on a marble table top, carved of wood and bone, with a rose tassel, rotting despite all her clean and careful ways. In the hall, a collection of walking sticks from all over the world marched along the wall. One had the fearsome face of a tribal god. She taught us the name, but it is long forgotten. Her husband was English, the last of the keepers of the empire, she said. They married late in life, when his diligence in the name of a young queen was no longer needed, and they came to her home place in America, the cottage on the bend in the road near our house. Somehow she fit everything they’d ever loved from their life in Africa into those four small rooms. She didn’t sound lonely too much when she said that. The colonel, her husband, was long dead by that time. She was used to her singular existence, one supposes, or as used to that as any child of God can ever be. We are never alone, if one thinks about it the right way. Her hands were slender and pale, the nails always pared just so, though they yellowed in the late years. She tutted over them with a frown, trying to remember something she used to know. White rice vinegar, she said, but there was something else. Her gaze moved out the window, to the soft green brightness of the yard. We sat and listened. The house smelled like old things, old roses. In the pauses, one heard the wood pop now and again, as if the walls were cracking their knuckles absently. Mrs. Lowell drew a breath. On the walk home, we speculated about the other ingredient. But perhaps it was something African, some exotic oil from a flower unknown to us. Perhaps she had only imagined the outcome. If it were possible to find it, we asked ourselves, and there was only enough to fill a small basin, what part of ourselves would we wash? Our hands were already feeling age, mine more than yours. You said you’d prefer your feet, because if they felt as they had when we were young, you’d walk out more, long distances away. Your eyes went a little dreamy. It sounded nice to me, too, and neither of us said we’d wash our faces in the basin. Perhaps we would have just a few years before. It is sad to think that Mrs. Lowell is gone, the last lady of another era. I never quite learned the knack of her fine calligraphy, but when someone talks of the old British empire, I can think of many relics out of Africa, ones that I touched with my hands. I know what Indian sandalwood smells like when it’s been captured in a rosewood box for thirty years and is released onto the limpid air of a Virginia summer. I recall we went into the garden then and she told us the names of flowers she’d brought over the ocean, the ones that survived our native soil and even the ones that did not. Mrs. Lowell described them with glistening eyes and color in her cheeks. To hear her, there were shades of scarlet and of yellow we had not yet seen in this world. In these bright spirits, she took us under the oaks and pointed to violets in pots she had nestled among the roots. I fetched three folding chairs of bamboo from the house while you stayed with her and we sat in the shade until the sun set and the fireflies came out, sparkling on the dark green field. The stories she told are forgotten to me, except in bits and pieces, but these are my treasures, crowded in my mind like all the things of her little home on the bend. In the middle of the night, long after the witching hour, the traffic thinned and the highway quieted. Then and only then could he hear the sounds that came from the other end of the house. Some nights he glowered into the shadows and decided it was racoons nosing through the plaster, peering up from under the broken floor boards. Other nights he rolled as quietly as he could over the floor, until he flattened along the wall, hoping to disappear into the shadows. Those were the nights he thought it was madmen searching the empty rooms for him. He was afraid even to breath, but his mouth moved in prayers he thought he’d forgotten. He caught a glimpse of himself one full moon night, weeks ago, reflected in a shard of broken glass. The eyes were shadowed like a skull and the hair and beard made him think of murderers people talked about when he was a boy. Murderers in the news. Murderers with a glint about them, who talked about themselves like they were making a mad poetry. The face that passed the shattered window and then peered back once more was his own, he knew, but it was a face he’d hate to find hovering above him in the dark of the night. His mother used to stroke the side of his face and call him her handsome boy. He remembered it, though it was hard to believe. One night when he was sure there were other men in the house – dark, brutal souls with evil in mind – he got himself in such a state that he started to cry. His whimpers were terrifying sounds in the empty room. When dawn finally broke, he was so relieved to see it, he bolted straight up and leaned out the window, drinking in the light on the distant mountains. “Morning has broken!” he said, startling the birds out of the brush. There was thunder in his voice that made him think of preachers he’d known. The words were from a song they learned in church. He wept as he remembered the little white church in the valley, the murmur of women talking in the yard after service, the aftershave of the men, their deep voices and shiny shoes. That had been a million years and sins ago. He went to a corner mounded high with spray paint cans and beer cans and bottles, recalling nights he’d hidden under the house while the kids drank and flirted and fucked in these dark, forgotten rooms. All his life he’d been a silent witness to ugly things, hiding in the shadows, watching and listening. “Never again,” he boomed. He loved the sound of his voice today, the way it had gone so deep and forceful. It was the voice of prophets in his ear. He found one can, tossed aside when headlights broached the drive one night and the kids ran out into the woods. A cop had walked the front of the house, shining his light in the busted windows. No one ever checked under the house. He went to the wall across from the door, the door closest to the drive, the door that was no more – only a casing with marks where hinges had hung. 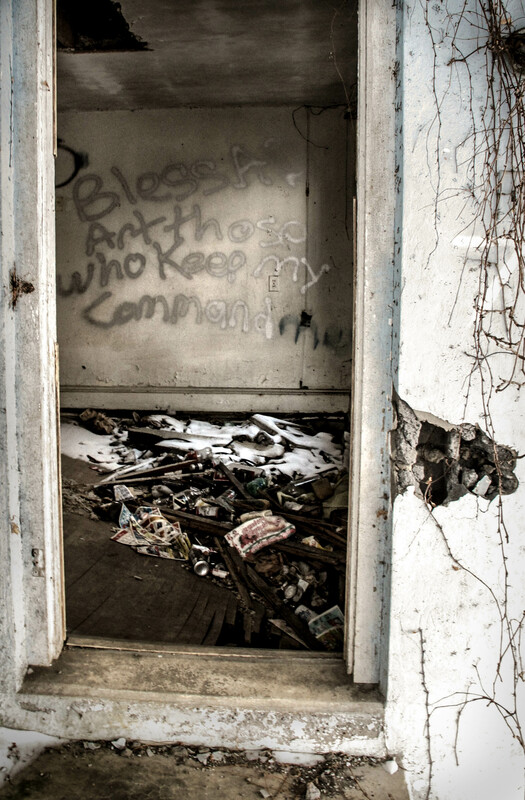 His hands shook as he wrote the words on the wall, but as each letter formed, he felt more sure of his purpose. The paint was silver and shone in the light in a way that seemed holy to him.